Automated Vehicles (AVs) have successfully operated on roadways along with conventional traffic in certain limited situations. However, widespread deployment of AVs will require them to operate over routes that include difficult sections, such as left turns across oncoming traffic. They will also have to deal with unplanned events, such as following the directions of a police officer in maneuvering around an accident scene. Fortunately, 5G mobile networks are becoming available that make it practical for a remote human driver to control an AV in situations that its on-board control system cannot handle. 5G mobile networks offer the high data rate and low latency needed to transmit detailed video from the vehicle to the remote operator, and send back steering, acceleration, and braking commands with no noticeable delay. The cost of adding remote driving capability to an AV should be minimal, since the vehicle will already have cameras and mechanical actuators as part of its automated control system. The remote driver of an AV is not expected to continously monitor the road ahead and respond to emergencies. That’s the job of the on-board automated control system. When the on-board system encounters a situation it can’t safely handle, it would typically respond by coming to a stop — either in its lane or off to the side — and requesting that a remote operator take over. This transition could take as long as 20-30 seconds. In most cases, however, the handoff from on-board computer to remote operator could be planned in advance, and should take place so smoothly that passengers on the AV will be unaware that it’s happening. An obstacle such as a fallen tree blocking an AV route will be unexpected only for the first vehicle to encounter it. All subsequent AVs on the route will be aware of the tree, and the system can have a remote operator ready to take over at that location. Because a remote driver would be needed for only a small fraction of a AV’s total operating time, one person could handle five or ten or more vehicles. Since the remote driver would typically be operating from a control room with other personnel, it would be possible to easily monitor his or her readiness and job performance. The world’s first commercial 5G service was introduced on October 1, 2018 by Verizon in Sacramento, CA and three other US cities. Initially it is being used to provide wireless home Internet service, but it is also being used in Sacramento to test remote driving. Even before the official 5G release, Phantom Auto of Mountain View, CA was using the network to operate empty automobiles on Sacramento streets from its home office about one hundred miles away. 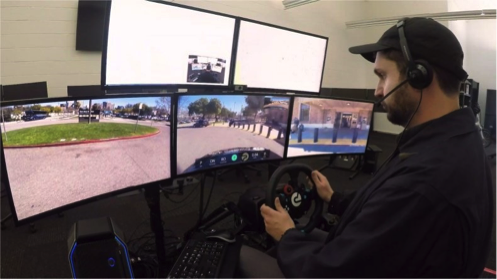 These tests will continue into 2019, and it is expected that when they are complete, remote driving will be used on certain sections of a planned automated passenger shuttle at the Sacramento campus of California State University. In addition to passenger vehicles, remote driving has been tested with various types of trucks. The Nuro R1 vehicle is only half as long and half as wide as a mid-sized car and has no driver’s compartment. The R1 has been operated on public streets, and Nuro and Kroger have announced they will start using it in late 2018 to deliver groceries to customers from one store in Scottsdale, Arizona. The much larger Einride electric truck also has no driver’s compartment. Einride uses Phantom Auto’s remote driving system, and after numerous tests has announced plans to operate on a short section of public roadway in Sweden this year. Instead of remote driving, a more limited intervention in the control of an AV involves supplying remote path advice. This approach assumes the on-board control system can handle the entire normal route but recognizes that unexpected events can require human input. With remote path advice, if an AV’s usual route were blocked by an obstacle the vehicle would stop and a remote operator would observe the situation by video, as with remote driving. Instead of then manually driving the vehicle, the operator would lay out a new path on a computer screen (or approve a path that the vehicle has proposed) and then command the AV to proceed along that path using its on-board control system to prevent collisions. This eliminates the need for a low latency wireless connection with the vehicle. Remote path advice appears to be the approach used by Waymo in its Arizona AV operations with Pacifica minivans. However, even Alphabet, Waymo’s parent company, has taken some interest in remote driving. In March 2018 its Gradient Ventures subsidiary led a funding round of $6 million for a remote driving startup called Scotty Labs.